I built a table for my sweet attic. I naturally required the table to be as sweet as the room it is in, so I made it a cool, low-slung modern table. I built it out of 3/4" MDF, and 1_1/4" steel piping. I painted it and sanded and used over 15 cans of various spray paints to get it kinda like I wanted, then I rubbed and rubbed some wax on the table top until it was shinny. It gave the table a very cool distressed look to it. It is also smooth as crazy, and waterproof! I finally assembled it in my attic. How does it look? Pictures don't do it justice... I think the total cost was around $130 finished. WLP that is really slick looking. I love the steel legs!! I've recently completed two projects, one was a pair of speakers and the other was a bed-stand thing. First the bed stand. I basically just hacked a couple of ideas together and did some improvising and revising, but it turned out very nice... and very heavy! 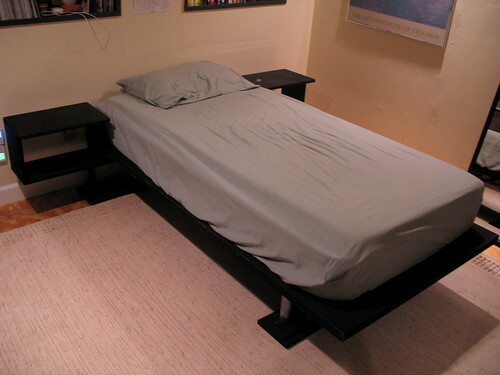 I built it in two sections, the headboard and the big double thick board. All MDF, so it is straight and smooth but heavy. Finished in ultra-flat black. Now I need to get some cool lamps for both sides, but otherwise yeah, I'm set! Rock solid, and shares the same steel legs as the rest of the furniture in the room that I've built. Now the speakers are pretty cool as well. They are a kit design from GR Research, the AV-3, with a few upgrades. My grandpa and I built the cabinets, and I finished them. The top section is gloss black with tons of lacquer, polished automotive style, and the lower section is wrapped in high-grade stainless steel. The bases are flat black with silver spikes. They sound awesome (naturally, they have very high-end components, and the MSRP is around $1400/pair, so the kit at $350-ish could be considered a steal. Now I'll just have to think up a new project, maybe some shelving? 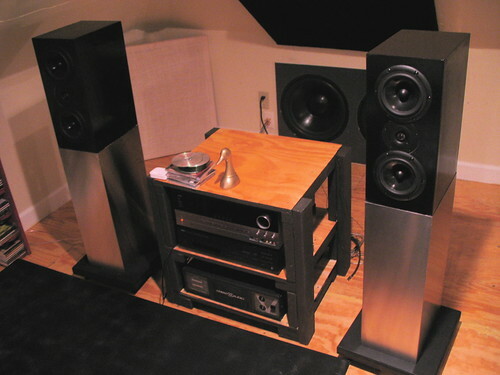 Those are some great-looking speakers, WLP! Makes my little shelf project seem pretty pathetic. I posted this in the computer set-up thread as well, but it fits here. It's just a small shelf made form 3/4" birch plywood that lets me slide my keyboard out of the way. And, it raises my display up to a more comfortable level. WLP, the work that you have done in that attic is very impressive. I wish I had a space like that where I could do what I wanted. Guess it'll just have to wait until I buy my own house. Back to what I was saying, Great job WLP!! Not to sound a bit limp or anything, but your parents must be pretty proud of you WLP, you have turned that attic into a really great space, using hard work, a lot of manual skills, really impressive. Yeah, I think they are, although my dad always seems to think that I'm using his money for all my projects. I actually pay for everything out of my own account, with my umpire earnings. Kinda like: "well, looks great! How much do you owe me for all that?" What kind of paint got you that awesome flat black, WLP? And any tips to applying it? I have a few things I want to build and paint like that. Great work overall, too. You should consider getting a "fixer-up" down the road someday. You could build a beautiful home. Nice craftsmanship WLP, but where's the damn spider tape for the bed legs? The spider tape, man! Are you completely mad?! Wasn't it you that had the run in the colony of brown recluses? I expect to see little spider-sized howitzers, booby-traps and other military hardware to win the final battle! If you are using MDF, try not to sand any of the surface. Only sand the joints. MDF absorbs unevenly if you break the factory finish too much. You could also light scuff the entire surface, but I wouldn't recommend it. If you are using other materials try to get the surface as even as possible. 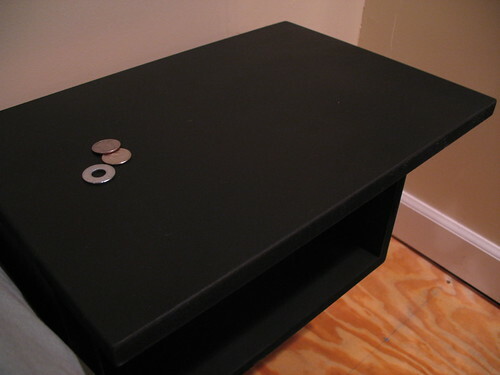 Give the item a good 2-3 coats of the flat black paint, and let dry to the touch. After the lacquer is applied let it dry the full amount so it is completely dry, then start wet-sanding the lacquer starting with a 400 grit on up to a 600 grit. Once it is to the point that wet sanding is ineffective, use some automotive "rubbing compound" to further remove small imperfections. The rubbing compound is like a cream and you just have to rub it into the finish with a rag. Then buff the rubbing compound away. At this point you have a gloss-black finish that should look pretty good, but if you want that ultra-smooth flat look then carefully take the original black paint, and mist it from farther away then normal. Try to avoid any concentration of paint. This will give you a really nice flat black surface, although you probably would get away fine just using the flat black without the whole lacquer stuff. WLP--great info on the painting. You are a patient and talented individual. I can't wait to give it a shot. I've had a lot of arts and crafts projects lately--I've moved into a new apartment (with a new (and first) wife!). 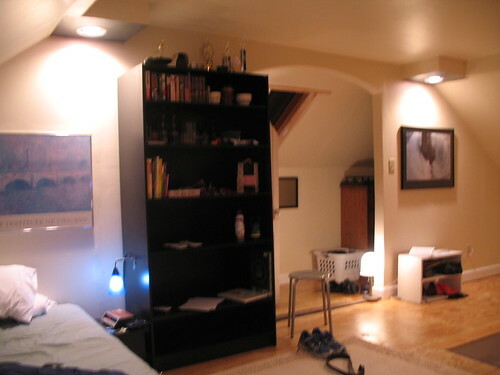 I was frustrated by the lack of space for an office, even before we moved in. Because there are so many big windows (which I love), there really wasn't a spot for an office or desk that wouldn't block a window or just be plain awkward. I've also had a neat project converting a clothes wardrobe into a cabinet for pots and pans / wine & liquor. But I want updates on any chain-mail or nerf projects, as well as some of the other unfinished ones first. Wow, that's a great job of hiding your office. I have to say, it's really packed in there, but at least it isn't like that out of the desk area. 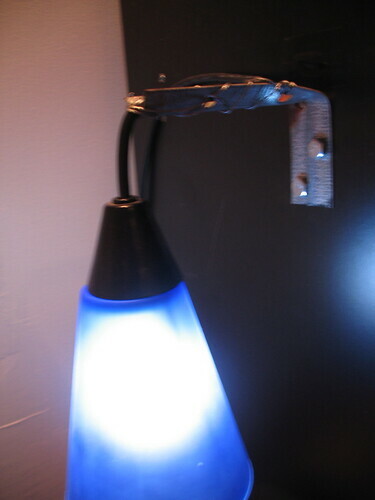 It is fully adjustable and awesome.. but it was hard to get a good picture of it.